I have been crafting. I made a fun little project, just because. No plans for it yet, except to enjoy it. I did my first true Fall project and made a Fall wreath. She is nice isn’t she. I like how she turned out even, or should I say especially, since I didn’t have a plan going in. I had this vague idea that I wanted some soft and soothing colors. And I wanted to use what I had on hand. No buying any materials this time round. I guess I love it when a (non-existent) plan comes together. To start I just rummaged around my craft room, the basement and the shed. Basically everywhere where I keep my ‘stuff”. My most important, can never part with it, because you never know when it comes in handy, stuff. I picked up things that looked good and somehow fell in the color range I vaguely had in my mind. I looked for things that felt Autumn to me, like they belonged in a Fall wreath. 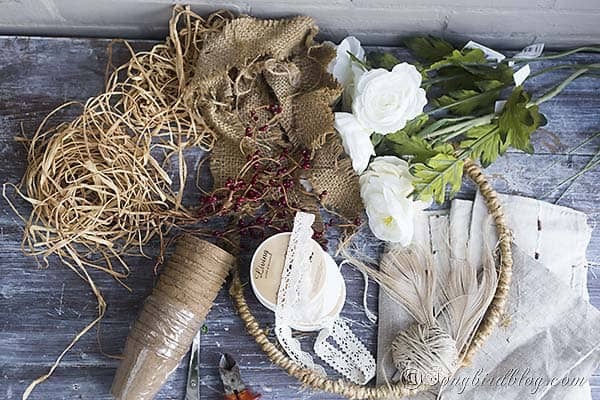 I ended up with fabric and burlap, lace and feathers, some fake flowers and raffia and some planting pots. It looked good together. Except those fake flowers. They were definitely a tad too brightly white. So my first order of business was to tone those down a bit. I gave them a bath. A tea bath. I put them all in a bowl. Put the kettle on and brewed some tea. Well actually I just hang a bunch of teabags in the bowl and filled her up with boiling water. As I was doing that I realized that I wasn’t even sure if these flowers could stand the heat of the water, but they were fine. I used the rest of the water to make myself a cuppa and while I left the flowers to simmer in the tea water, I went on with the next step. Ripping the fabric into strips. I cut and I ripped until most of my fabric was turned into a pile of scraps. And then I started knotting. I advise to leave the fabric scraps a bit longer than you will ultimately want them, simply because all that tying and knotting is so much easier with a strip that is a bit longer. This is how she looked at this stage. I thought she looked pretty already. I could totally imagine stopping at this point, like I did when I made my first rag / fabric scrap wreath back in the old days. But as much as I liked the fabricky goodness a vision was coming alive and I wanted to see how my flowers were doing in their bath. The soaking had definitely tuned that white down in to a lovely natural soft pinky/brown. I just didn’t like those bright yellow hearts. So I tried to tone those down with some ink (didn’t work so well, but it did give the petals a nice edge). In the end I just dabbled some craft paint on them with a brush. That did the trick. And then the assembly began. Some hydrangea Annabelle from my garden…..
And some squiggly bead/berry branches I found in my florist’s stash. I simply pushed the flower stems through the knots in the fabric and when necessary added a bit of florist wire to secure them. This was a fun project. I don’t really have a place for her yet. But I am sure that won’t be long anymore. Fall is definitely sneaking into my home, and every day a few shells and sea stars are moving out and some pine cones and scented candles are moving in. This little wreath will fit in, in no time. Oh and those flower pots and feathers? Didn’t use them and they have been put away for another project some day. As always, your talent blows me away Marianne! Very pretty indeed. Oh thank you! That is so sweet of you to say. That’s a real beautiful wreath! And I love how you dyed the flowers, what a neat idea! Thank you! Tea dying is an old trick but it works every time. And it is fun too. I went in this time wanting to use my fabric and the hydrangeas from my front yard, and this is how it turned out. You are right great minds must think alike. That turned out gorgeous, I love the colors… I may have to try something like that! Yes do! 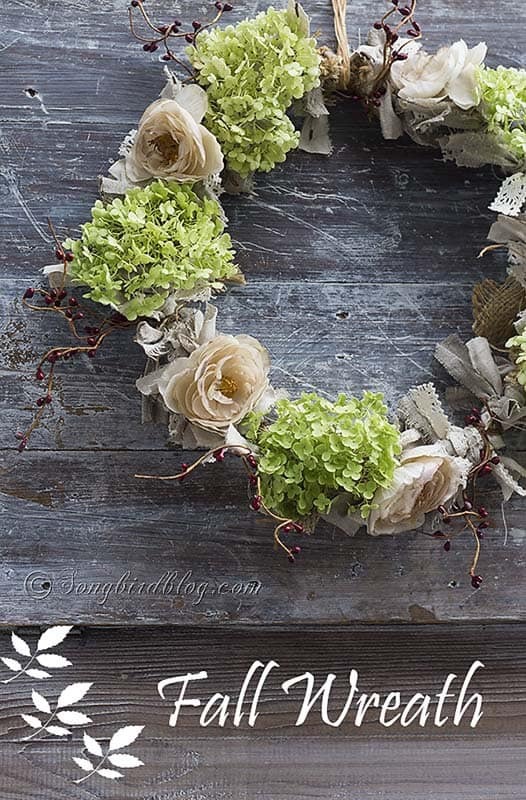 It is a fun wreath to make. Beautiful wreath and a great idea with the flowers. I never thought it would work with artificial! I’m inspired, thank you! Love your wreath, great job on distressing the flowers. They’re perfect with the hydrangeas. So pretty! What did you use for the wreath form? I see hydrangea there and that is one thing I have a LOT of. I love your wreath. It’s Fall and delicate at the same time. Just beautiful. I’d love to have you link up at What to do Weekends (great weekend project, right?). I’ve been wanting to do a kind of rag wreath tearing strips from some of my dear Papas old undershirts. I bleached them white again and want to make a small wreath for the back of the dining chair for Christmas. You’ve inspired me to use perhaps the brown tiny tweed checked fabric from the hemming of his suit of the 1970’s (yes, he’d saved it) to make the flowers. And if its small I won’t need quite as many strips of fabric. I’m trying to only use the things in the little suitcase he kept his darning in so I have a few of his flat cotton socks I could also use for strips plus he had lots of string and various kinds of thicker threads I can add! Thank you for the inspiration!!! I miss my Papa. He was so kind, wise, Godly, loving, and full of fun and laughter. He would say Oh my, my Lelah Pa Lelah! I’d have never thought to make that out of my old socks and undershirts. He’d have smiled and checked it out and been tickled. My Swedish Papa. I’ve been missing him so much these days. Oh that is such a great and truly lovely idea. 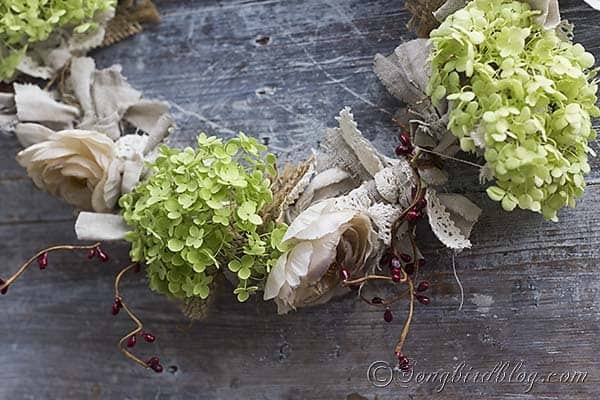 I think these rag wreaths and garlands are perfect for using up sentimental bits of fabric. I just know that your Papa would love it. Things used are so much better than things just ‘kept’ in my book. It will be as if he is with you during your Christmas meal if you have your lovely little wreaths hanging on the chairs. Good luck with this project. Will you let me know how it turned out? Love the way this turned out! The colors and textures are perfect. So nice when things just organically come together and end up so pretty! I love it, love it, love it! No I am actually love struck to this! Such a beautiful & elegant wreath it is. The advent of fall has surely enhanced that creative flame in you! Super!! !